You don't have to do anything else after you click install rules so no reason for a warning. Gui that pops up immediately is saying installing rules while it's installing(check image linked). The initial rule installation windows when it appears tells you to not close it and wait(check image linked). I see what you mean. It's basically because rehips installer when you select install rules calls rulepack and that does the rule installing. 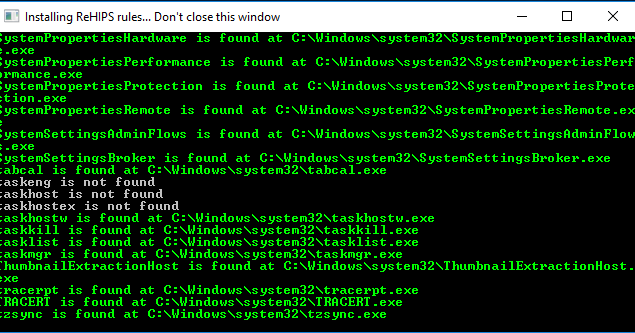 The cmd alike windows you see if rule pack. When you do the rule install from the gui no windows appear. I assume reason that devs made the window visible the first time is because you need to somehow know things are getting installed(the first rule install takes a few seconds). It's because the program that launches IE is set to execute programs not isolated(allow). 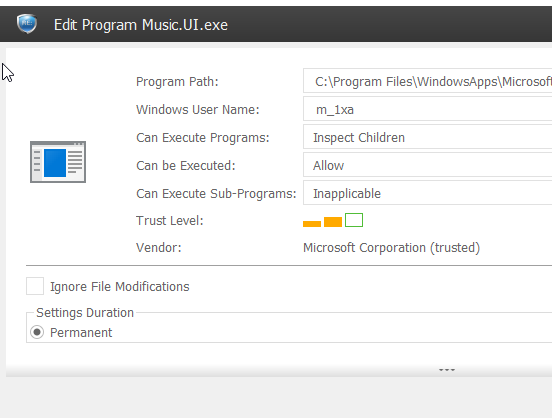 If you want a program to launch other programs based on your already set rules(in your example isolated) the execute programs needs to be set to inspect children. It's already added in the next version of rehips. I never tried such thing but i would assume it will launch as the locale it would run if not isolated by rehips. The program probably somehow saves what locale to use in it's settings folder which rehips doesn't mess with. Rehips just launches the program isolated as another user. If you try it you can tell us how it went. No you don't need to do anything in rehips. 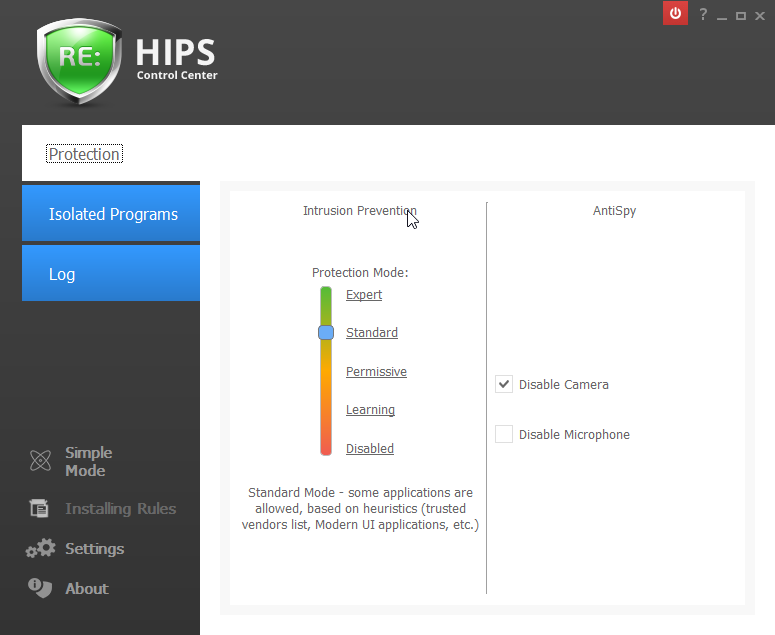 About HMPA i know you need to add exceptions for rehips(rehips gui, agent, service) in the exploit mitigation module or else the system and rehips has weird behaviour. About the rest of the programs i don't think so but if you notice anything weird try exceptions for rehips first. which 3rd-party programs are included in initial rules, is there list? If the program is not in the install program list and registry rehips can't figure out it's there. It doesn't scan all your pc to see if it finds something. You can create rules for Firefox manually and run it isolated though. About default rules when you create rules for portable firefox it applies those. In firefox though you can remove hook control and different desktop because it's not needed. Different desktop is only needed if hook control has to be enabled for an isolated program to work. When you have hook control enabled to have the same level of protection you need to enable different desktop. Next releases will have something called rule pack which is an editable list of programs you use on your pc so you can for example change the firefox rules to include portable firefox in a specific location you have. Can't list all the programs that run isolated but it's most popular browsers and some office application and pdf applications. About autohide border a developer will need to answer you but for color and size the option was there on 2.1 and was removed so probably not. You can change it manually though from settings.xml(color is RGB but not sure on the format so devs needs to tell you but you can do size easily) in rehips install folder. You mean like in Sandboxie? That can be implemented, but is there any use for this? Personally I never used this feature. Am I missing something? Just don't focus the window when taking the screenshot and it will not have a red frame. Correct. In such case that you need to make tutorials then i guess go in setting and disable the border.